We start project section with the simplest project as similar as "hello world" program in C language. 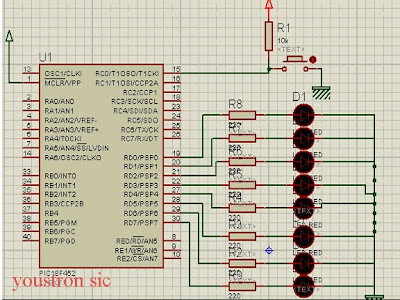 As this is our first project we fly slowly as we go further in this section we deal with more complicated projects. 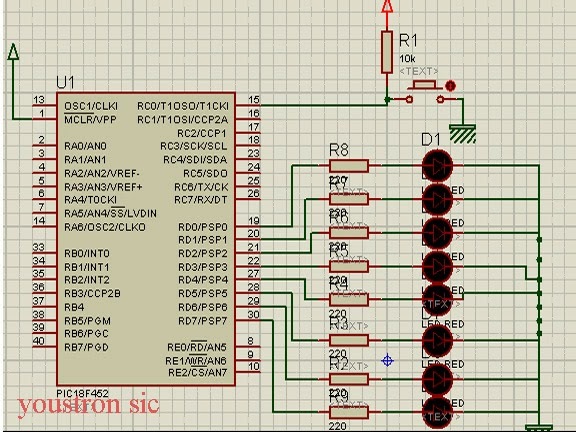 AIM: If the switch(button) connected to microcontroller is pressed, then Leds should ON for 1sec and OFF for 1sec it should repeat for 10times(ON OFF shows blinking effect), again after 10times of blinking check the switch and repeat the process. Look at the above circuit diagram, one end of switch is connected to power source & portc.f0 and other end is grounded. 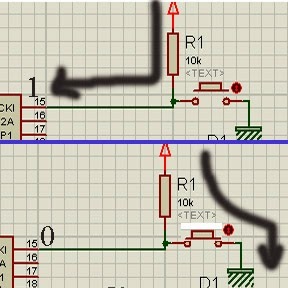 Portc pin0 will be always high(i.e 1) because there is a path from power to portc.f0 pin, when switch is pressed path will be created from power source to ground through switch so portc.f0 will be zero voltage(i.e '0') .Look at the below fig to understand clearly. So, in order to know whether switch is pressed or not we need to check its status if its '0' then switch is pressed if its '1' then switch is not pressed. Note: "0b" is binary way of representation and "0x" is the hexadecimal representation.. 0b11111111 is similar as 0xFF. We can write the same program in different ways, i have different reasons for chosen the above style of code.